Your Open Water course taught you how to dive. The PADI Advanced Open Water Diver course shows you the why: exploration, excitement and cool new experiences. And the confidence to enjoy. It’s a lot less studying and a whole different kind of fun to the PADI Open Water course, designed to advance your diving skills. You don’t need to be “advanced” to take the Advanced course – think of it more like PADI Open Water Diver Part 2. Start right after your Open Water certification and get more out of every dive you make, sooner than you might think. Each of your 5 PADI Advanced Open Water Diver training (“Adventure”) dives expands your scuba skills and builds your confidence in a bunch of different ways – with plenty of fun thrown in, too. The Deep and Navigation dives are required, and your Dive Bus instructor will be happy to advise which of the other 3 we think you’ll enjoy the most, or get the most out of. Each Adventure Dive is also the first dive of the corresponding PADI Specialty Diver Course. So if something particularly lights your candle, you’re already on your way to discovering more, putting another PADI certification under your weight belt, and getting a step closer to the prestigious PADI Master Scuba Diver rating. Try out new, cool, fun stuff underwater, become certified to dive to 100ft / 30m and learn additional diving skills and confidence. Duration: 5 dives over 2 diving days. Save time: start today online! some great reasons to keep on diving and a lot of great ways to keep your diving FUN! Deep Dive: It won't take long before curiosity will get the better of you and you'll be intrigued to find out what lies deeper down the reef into the blue... You’ll learn how to plan dives to deal with the physiological effects and challenges of deeper scuba diving, safely. Underwater Naturalist: Learn about what you're seeing underwater. We guarantee it will enhance each dive you make. Remember: anyone can spot the big stuff; smart divers know how to spot the smaller stuff. Night: Experience the underwater world in a different light - quite literally. There’s a small additional charge and this dive is at your Instructor's discretion, based on your diving skills and confidence. What will I be qualified to do? Dive to a maximum of 100ft / 30 m and explore deeper, more advanced dive sites. The world is your lobster... Being Advanced Open Water certified will open up a whole new set of exciting ways to continue your diving adventures. PADI eLearning Advanced Open Water Diver Online.This web-based learning system lets you learn about seven of the most popular Adventures Dives – including the required Deep and Underwater Navigation Adventure Dives, plus Boat, Night, Peak Performance Buoyancy, Underwater Naturalist and Wreck Adventure Dives. Study at your own pace when you want, through an easy-to-use, interactive program.You also have access to an online version of the Adventures in Diving manual and can complete sections for other Adventure Dives as directed by your PADI Instructor. Beyond using basic scuba equipment, you’ll need a compass and dive knife or dive tool. You’ll also use specialized gear depending on the Adventure Dives you make – for example a flashlight on the Night Dive or lift bag for Search and Recovery. Your PADI Instructor will explain the equipment that you need and may suggest additional gear, such as dive light for night diving or lift bag for search and recovery diving. 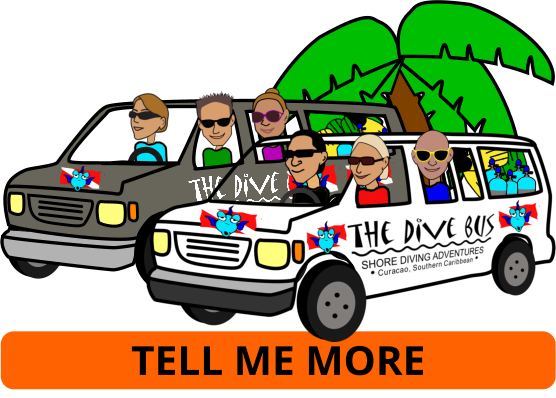 All the additional or specialised equipment you’ll need for your Adventure dives are included in the course price – and a Dive Bus Graduate, you’ll get discounts when you buy your own from The Dive Bus retail shop, as well as advice and guidance from your Dive Bus Instructor. NEW! PADI AWARE Advanced Open Water course - only at The Dive Bus! Care about protecting and sustaining our reefs and oceans? No worries, the PADI Adventure Diver course was designed for you. 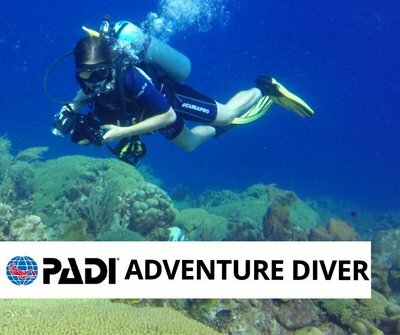 It takes only 3 "Adventure" training dives to earn this certification, and you can simply upgrade to PADI Advanced Open Water Diver with 2 more Adventure dives on your next Curacao dive vacation. 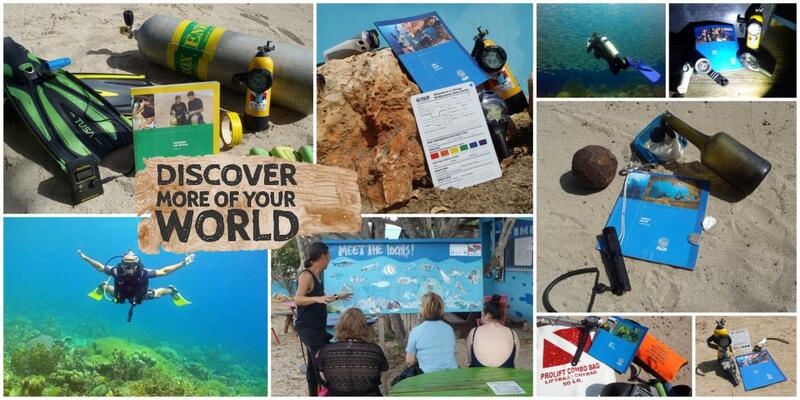 to discover the best of the rest of underwater Curacao..? ...getting more out of every dive? Did you know you already started 5 different PADI Specialty courses on your PADI Advanced Open Water course?